Little Rock How about some more good news in these crazy days? It was wonderful to see a woman with a Casa de Maryland t-shirt on the front page of my hometown paper. Having done some work with Casa and their great director, Gustavo Torres, I could just feel their excitement at seeing the crowds and being able to play a role in helping people find a clear path here. In another paper there were pictures of the long lines in Los Angeles in the smallish office of our old ally, CIRLA, the Coalition for Immigration Reform in Los Angeles, and their wonderful director, Angelica Salas, our old friend, who also has been tireless in fighting for immigrant rights in the United States. Smiles were everywhere. One could almost sense palpably that hope was being reborn. The real hope has to be that this slight reprieve for these young DREAMers will create some momentum for reform and justice here that can no longer be denied. For all of the right wing handwringing about President Obama’s executive order here, this is a happy day for sure but the reality is that this is a small step, a breath of fresh air, and an opportunity to stand safe in the sun. This is not amnesty. In fact this is all very temporary. 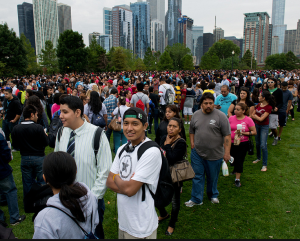 These thousands of young people are applying for “deferred action,” which confers a two-year reprieve for younger immigrants from prosecution and fears around their undocumented status based on their educational or military status. No one knows what may happen in two years, unless there is real immigration reform or passage of the DREAM Act in some form or fashion. Furthermore even this “deferred action” is contingent. For students, school has to be mastered with satisfactory attendance and grades. For others, degrees obtained can now be used and employers are also safe in hiring, as I understand it, at least during this period. All “deferred action” stands for is what it really says. It is “deferred action” for deportation for successful applicants under this newly initiated policy for children brought to the United States and raised here by their parents. Their circumstances where not a part of conscious choices on their part, but a matter of adaptation in the way of all children moved to a new location which in this case meant a new country different than where they were born. Obama’s order was more a simply expression about human rights than it was a step towards immigration reform. This temporary reprieve lifts the weight of fear from police arrest and prosecution and family separations from millions in this situation. It is not a permanent “get out of jail” pass, but it is a “walk free in the sun” opportunity. Our excitement lies in the belief and hope that having taken this step, there can now be no going back, but there are many long fights before there is genuine and permanent relief for these young people and many other immigrants who have made their contributions here and have made America their home. No DREAM has come true, but here’s hoping! This entry was posted in immigration reform and tagged angelica salas, Casa de Maryland, CIRLA, DREAM Act, Gustavo Torres, President Obama, the Coalition for Immigration Reform in Los Angeles, young immigrants by Wade. Bookmark the permalink.